If you’ve ever been unsure about house plant identification or had trouble deciding among several choices for gift-giving, you’ll be happy to know that, this month, Flower Shop Network is launching a new gallery of pictures of houseplants in order to help make your selection easier. There are numerous varieties of tropical plants, available from your local florist, which are suitable for indoor growing. Most of these species have earned their popularity because of their attractive foliage and the ease of their care. Occasionally, we may even be rewarded with flowers from a few of them, such as Peace Lilies (Spathiphyllum). The plants we grow most often in our homes are usually juvenile forms of potentially much larger tropical plants, but given the limitations of space, light, humidity, and nutrition, it’s not likely that they would ever reach mature size. 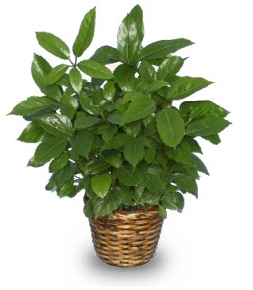 For example, the popular Schefflera, or Umbrella Tree, is normally sold as a young shrub between 18 inches and four feet tall. But planted out in the open in its native Australia, it readily becomes a woody tree of forty or more feet tall, blooming at maturity with long spikes of bright red flowers. House plant identification becomes a little easier if we learn to recognize a few of the characteristics of some of the more commonly available plant families. Among the more popular plants for indoor growing are the Dracaenas. These plants typically have linear-lanceolate foliage which grows in whorls from the tops of slowly elongating stems. Many of the Dracaenas have colorfully striped foliage, such as the Corn Plant, with broad yellow stripes on its softly arching leaves, and the Red Margined Dracaena, which sports narrow red lines along the edges of its spiky, dark green leaf blades. 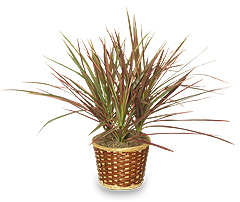 Dracaenas are well adapted to indoor growing conditions, being fairly undemanding as to light and moisture requirements. Large, well-grown plants will sometimes produce racemes of white or ivory flowers which are intensely fragrant at night. Flowering is a rare event among Dracaenas, so we appreciate them more for their foliage as well as their sculptural forms. Scheffleras and their cousins, the Arboricolas (both Brassia species) feature compound leaves five to seven, or more, oval leaflets arranged like the spokes of a wheel around the end a central leaf stem (petiole) which grows off the side of the main trunk. They prefer a bit more light and more even moisture than the Dracaenas. Most Scheffleras are an unmarked, deep glossy green in color, but there is a very colorful variety of Arboricola with bright yellow markings on its foliage. 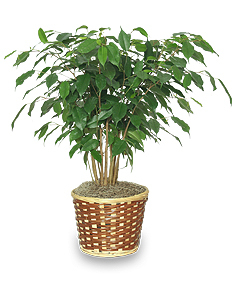 The Ficus, or fig, family has contributed several familiar varieties to our indoor gardens, including the popular Rubber Plant (Ficus elastica), the bold Fiddle Leaf Fig (Ficus lyrata), and the ubiquitous Benjamin Fig (Ficus benjamina), veritable forests of which have been planted in airports and shopping malls around the world. All of the upright Ficus species (there are some vining ones as well) have the potential to become small trees. They do well in bright, indirect light, and prefer their soil to get just a little dry between thorough waterings. New leaves emerge one at a time from the ends of their stems. One key to the identification of these house plants is the fact that they all exude a milky white sap when cut or bruised. Perhaps the most popular as well as the most diverse group of indoor plants consists of members of the Aroid family, including Philodendrons, Pothos, Chinese Evergreens, Dieffenbachias, and the aforementioned Peace Lilies. These are plants of the forest floor in their native tropics, and thus are well adapted to the low light conditions of most homes and offices. From climbing vines to spreading clumps to low, herbaceous shrubs, the Aroid tribe offers a wide variety of foliage forms and variegation patterns (there are several pictures of these house plants in our new gallery). Most are quite easy to grow, requiring evenly moist soil and moderate light levels. Philodendrons (normally a uniform green in color) and pothos (brightly marbled with yellow or white on a green background) are frequently grown on bark totem poles for support. If permitted to climb, the leaves of these vines will become successively larger as they grow. But left to dangle, the leaves stay the same size or gradually become smaller. Shrubby Chinese Evergreens and Dieffenbachias feature an amazing diversity of colorful foliage patterns, while the leafy Peace Lilies, which are usually all green in color, produce long lasting, white, flag-like blossoms when grown well. Be sure to visit Flower Shop Network’s houseplant gallery for more choices, view Houseplant Care Info or feel free to Ask Our Plant Expert your house plant identification questions. Happy growing! It’s hard to tell from the picture, Sarah, but it looks like you have a Split-leaf Philodendron houseplant.